Gary is a snail who lives in a pineapple, balanced precariously on a wall overlooking a deep trench. He is trapped there, waiting for the day when he is forced to race against a giant machine. I’m a little concerned about him. Gary sounded like a cool dude. He’s probably one of the few—if not the only!—gastropods to become a founding member of a tech company. But even though Gary seems very capable (he can go fast, which is a highly valued skill in Silicon Valley) and relatable (he is impatient, just like me), it seemed that a dark future awaited Gary. Gary got in on the ground floor of some new and exciting innovation, but his CEO would measure success by Gary’s eventual humiliation and defeat. It’s not unheard of for tech companies to pit their employees against each other in the race for success, but this seemed cruel. So I set out to learn more about Gary’s experience at The Boring Company. What did he think about their labor practices? Was he happy waiting inside the pineapple? What would he do if his shares were about to vest when he finally lost to Godot, the boring machine? First, I needed to confirm that Gary was real. Once I knew that, I could find out more about his life inside the Boring Company. Two weeks later, Musk finally complied, posting a picture of Gary on Twitter and Instagram. This was exciting because it was my first Gary sighting, but I was also very worried. What if Gary fell down into the boring machine pit and was crushed by Godot? The Boring Company seemed like a very unsafe workplace for Gary. To find out what he thought about the impending race, I sent an interview request to the Boring Company. But unfortunately, the PR folks over at Big Tunnel didn’t want to grant media access to Gary. But when pressed, the company said I might get to meet Gary later in the summer. In June, I tuned into Tesla’s earnings call, hoping for news of Gary. But I was disappointed—Musk never mentioned Gary, and did not respond to a follow-up question about him. July passed with no news from Gary. With summer almost over, I followed up with the Boring Company’s PR team, but got no response. It’d been well over a month without any Gary updates. Was he even still alive? I decided to let the Boring Company know about my concerns. The spokesperson assured me that Gary was okay, but called him “slow,” which seemed like a red flag. 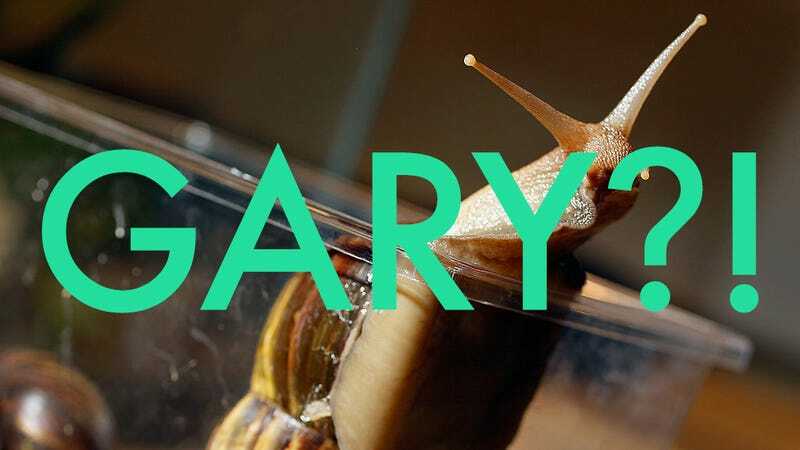 I had always heard Gary described as “fast” and a “speed demon” so maybe the spokesperson was referring to a different snail. At this point, I alerted some of my coworkers at Gizmodo to the situation. Bryan agreed to help me with my investigation and sent Musk some direct messages on Twitter. Musk responded but did not answer our Gary questions. With the Boring Company stonewalling me, it was time to contact some experts. I spoke to Paul Callomon, the collection manager of malacology, invertebrate paleontology and general invertebrates at the Academy of Natural Sciences of Drexel University. Callomon told me that Gary might be okay with participating in the race against Godot. “They would of course not know that they were in a race, so that itself would not bother them,” Callomon said. What a relief! Callomon also told me that the ideal race track for Gary would probably be smooth, rather than the rocky path carved by Godot. “They slide along on a trail of slime. A smooth surface might therefore seem most considerate,” he explained. However, because the only picture of Gary isn’t very clear, Callomon was not quite sure how fast he might go. Gary might be “some form of US-native pulmonate (air-breathing) snail,” but Callomon couldn’t be certain. “There are at least 20,000 named species of terrestrial mollusk, ranging from the tiny—no more than 2 mm long as adults—to the huge Giant African Snail, which can be a foot long when fully extended. Carnivorous Wolf Snails from Florida can go pretty fast in pursuit of prey—maybe a couple of feet in a minute—but you’d need to trawl the literature to find an exact rate,” he said. I also tried reaching out to the Boring Company’s PR rep one more time for news of Gary. I’ll update this story if I hear back. Additional reporting by Bryan Menegus. Do you have information about Gary’s lifestyle and wellbeing? Please email me, or contact Gizmodo anonymously using SecureDrop.